Visit the new Art Gallery! Check out the highlights of the Summer issue. Coming July 30th. Check out the results of the Preditors and Editors (tm) 2002 Readers Poll. Twilight Times has been in the top twenty ezines on the web for fiction and poetry for the past five years! Dragon's Moon, a YA fantasy by Bent Lorentzen. Author interview. Unraveled, New Age novel by Celia A. Leaman. Author interview. eBook Ecstasy is a free monthly newsletter containing the latest epublishing news. Each issue contains current releases with four star reviews from various epublishers. Subscribe to eBook Ecstasy today. [Publisher's note.] 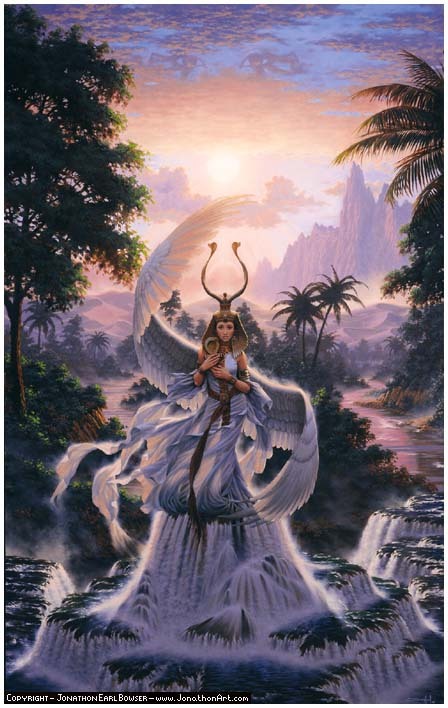 Limited-Edition prints of "Isis - Child of Earth and Sky" are available. Signed by the artist, Jonathan Earl Bowser. The Complete Guide to Writing Fantasy is now available from Twilight Times Books. A complete fantasy resource in one volume - Character Creation, Clothing and Weapons, Combat, Health and Medicine, Magic, Mythology, World Building and much more. cover artwork for Spring 2003 issue of Twilight Times. This page last updated 05-09-03.